Chad Baker: The previous owners chose the outside colors. We were happy with their decision to paint the brick; though not original, we feel it gives the house a much cleaner appearance. We did paint the orange door, which is an original door to the house and was located at another entrance to the basement. This color was chosen to play off the kitchen cabinet door colors. 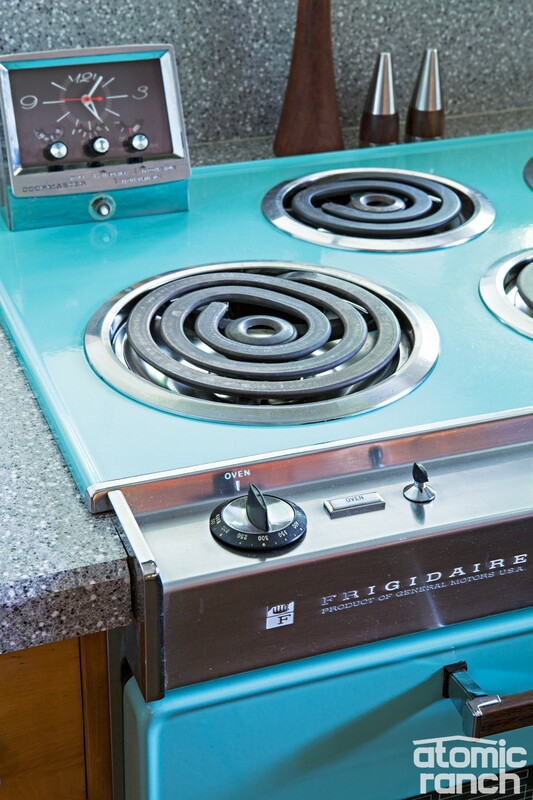 While some details of the original kitchen were lost to previous owners, the vintage Frigidaire remained in good condition. AR: Where were you able to find this oven? CB: We were very fortunate. This is the original oven to the house. I found a matching oven but in a different finish and purchased it for a backup to keep this one alive for the rest of our lives. 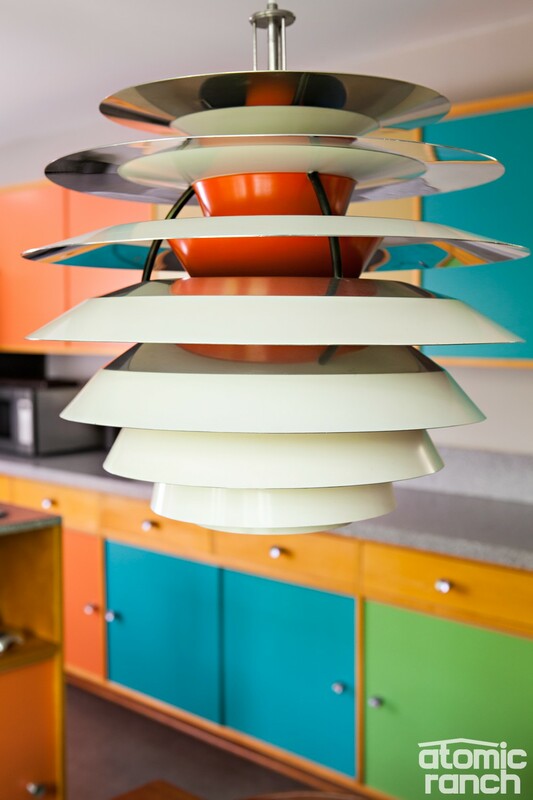 The contrast lamp is the perfect period addition to the original colorful cabinetry. AR: Tell us about the color scheme of the kitchen. CB: The kitchen colors are original. 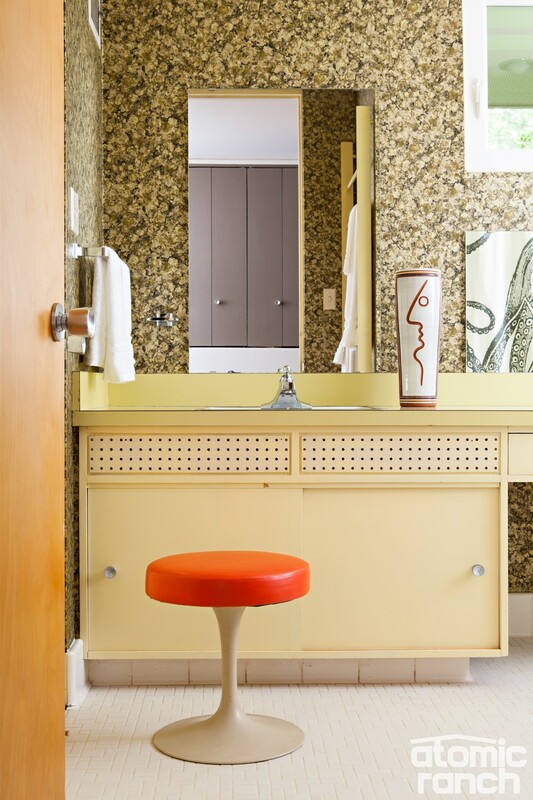 Jim Sherrill (The home’s architect) seemed to use 4 colors in his kitchen designs around this time period. AR: Where is the lamp from and who designed it? CB: The lamp is from Denmark and Designed by Poul Henningsen named the PH Contrast. This was a find at Brimfield before we even owned the house and I had chosen to hold onto it. What a perfect fit it turned out to be. 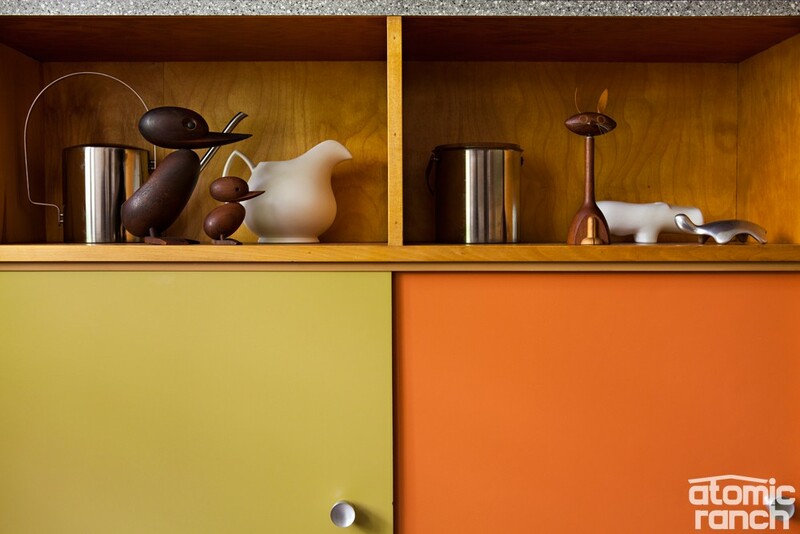 Neutral wood, metal and white ceramic collectibles are the perfect accompaniment for unchanged cabinetry. AR: Did you arrange the sculptures in any particular way? CB: We arranged them where they are pleasing to the eye by creating height and depth. This was just the perfect mix of our vintage finds. AR: Is the cabinetry custom? CB: The cabinets are original and have never been refinished. 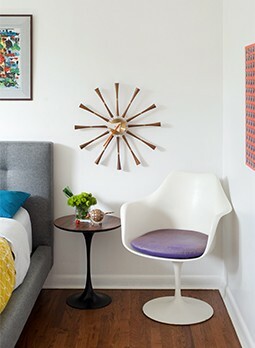 A George Nelson spindle clock is a great pairing with the Herman Miller rocker, a great find. AR: Was this room remodeled? CB: This is the entryway to the home. This is all original walls and floor. AR: Tell us a bit about the chair. CB: The Chair is a First Year Production Herman Miller Rope Edge Rocker with original Zenith Label and all original base. It was a very rare find that was from the original owners’ estate, just the way we like to find items for our personal collection. AR: The floor is gorgeous. What is the material? CB: The floor is the original Blue/Green Flagstones. 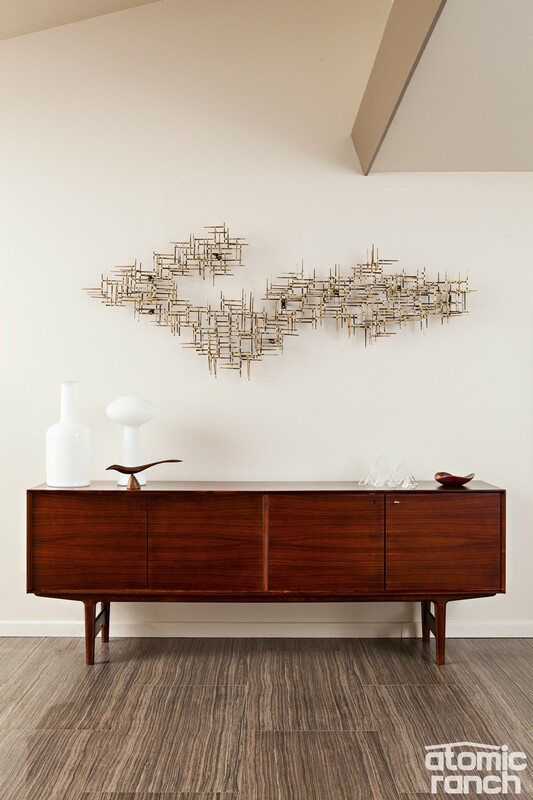 Artist Mark Weinstein of Mark Creates LLC began making these metal wall sculptures and more in 1967. AR: Tell me about the wall art. Who designed it? CB: This is made from Cut Nails by Marc Creates St Louis (Original label still intact). We felt it was the perfect fit for the house, the vaulted ceiling takes the same form as this sculpture and the scale was perfect for that wall and space. AR: Another set of beautiful floors. What are these made of? CB: These are 20″x40″ porcelain tiles from Italy. This was the most difficult and time-consuming remodel project we attempted. We would never have achieved this incredible floor without our Custom Carpenter Hal Clement. 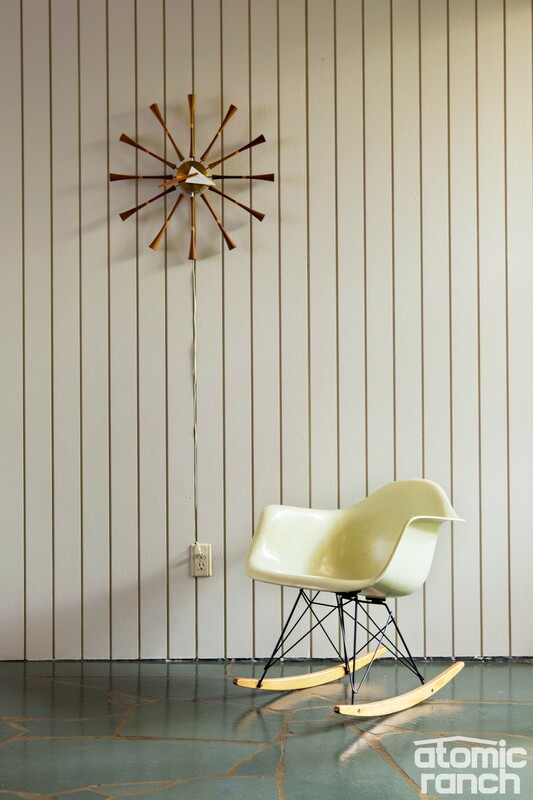 A modern floor idea contrasts nicely with the original features of the house and vintage pieces. 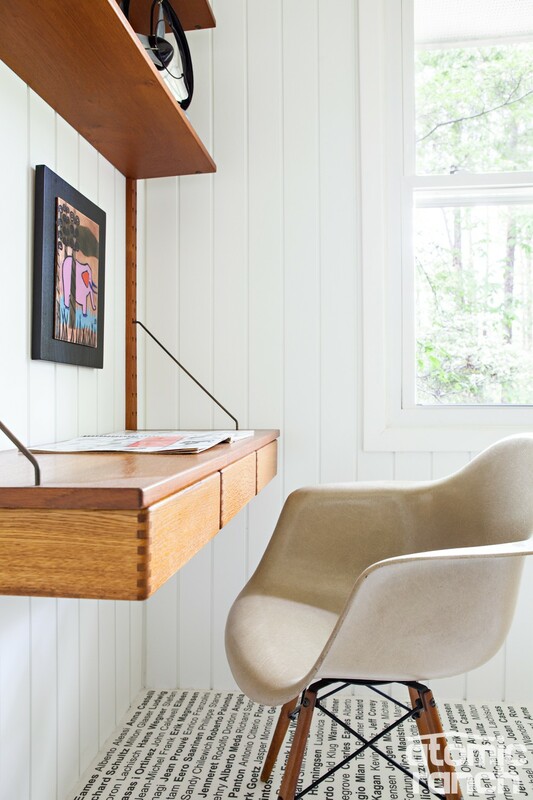 AR: Are the desk, shelving or paneling custom? CB: No, it is vintage 1960s from Denmark and made of teak, and the paneling is original. 100 designers grace the floor of the Bakers’ home, which is a true homage to the designs of the era in and of itself. AR: All the different flooring throughout this home is incredible! Tell me about how the text floor was designed. CB: This floor was a combination of ideas that start with some floor tiles I had found online but could never find their manufacturer. We tossed around many ways of achieving words on a floor and this was our result. This used to be an outside enclosed porch and had wood floor. We used rebar and wire mesh and fastened it down to the wood floor. We worked with a local graphics company to make the 10 decals of 100 different designers needed to cover the floor. This floor gets a lot of attention to those who see it in person. We were on a local home and garden tour and those touring the home would just stand back and look at it as if you’re not supposed to step on it. It is really a fun floor and exactly what we were looking for. 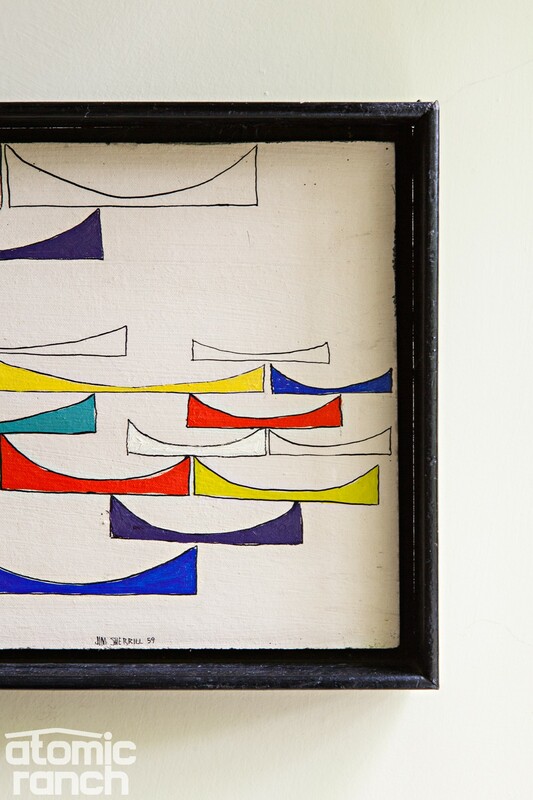 A painting by the home’s architect, Jim Sherrill, gives the house a sense of closure. AR: Who is the artwork by, what’s the title, year, medium? CB: This was done by the home’s Architect Jim Sherrill. It is untitled. Dated 1959. Medium is Oil on Board. AR: What do you like most about this piece? CB: I love the fact it was done by the home’s architect, I mean how many can have a piece of art from their home’s architect? 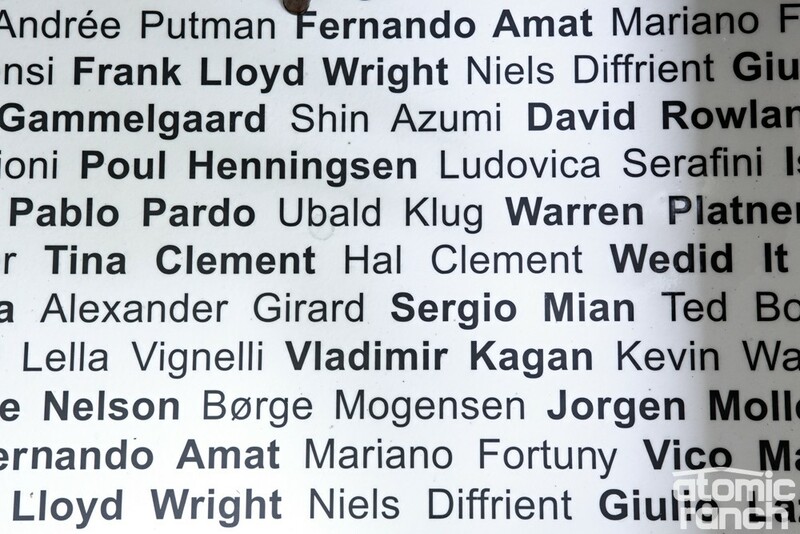 I also love that it is a piece of his early artwork. The form and the color work perfectly in our home. It may look brand new, but this bathroom is nearly 100% original, just as the Bakers like it. AR: What updates, if any, were needed in the bathroom? CB: We have not done any updates to this bathroom. Besides the faucets, it is 100% original. We have the original faucets and are having them restored to go back in the bathroom. 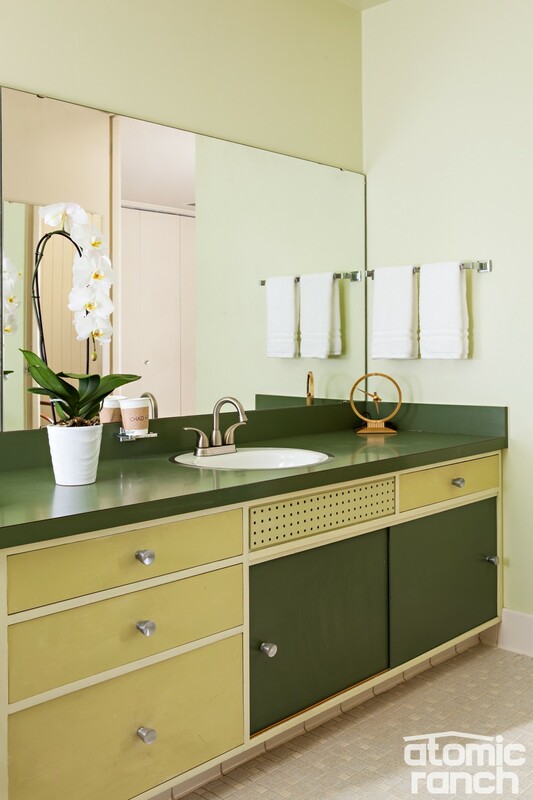 With walls seemingly made of granite, a unique original wallpaper that has stood the test of time, this bathroom has a glamour and cheerfulness. AR: How did you choose the wallpaper for this bathroom? CB: The wallpaper is original and in amazing condition. AR: Who designed the stool and where did you find it? CB: The stool was designed by Eero Saarinen and manufactured by Knoll. This stool came from the Century II Convention center in Wichita, Kansas. Want to see the rest of this stunning home and all of its superb midmod details in place? 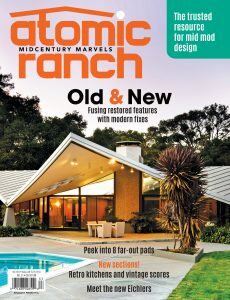 Pick up a copy of the fall issue of Atomic Ranch today and get the rest of the story!